The two fund management companies set up to handle Mahapola Higher Education Trust Fund are to be liquidated after incurring losses of over Rs. 2.5 billion during the last 15 years. The Government this week gave approval to a proposal by Higher Education Minister Dr. Wijeyadasa Rajapakshe to liquidate both National Wealth Corporation Ltd. and National Wealth Corporation Ltd., transferring all assets held by the two companies to the Mahapola Higher Education Trust Fund. Seeking Cabinet approval to wind up the companies, the Minister stressed that the two companies set up as sub companies of the Trust Fund had made continuous losses during the 15 years. Further the delegation of fund management is against the clauses laid out when it was established through a trust deed and a Parliamentary Act. The Minister pointed out that even though the Board of Directors had outlined reasons for the losses, the explanations were not reasonable causes. Further he told Cabinet that although the two companies had employed a large number of people with salaries and allowances being paid from the principal fund to manage the work, the two companies had failed to obtain “maximum profit status or optimum profit through investment of the fund”. Losses to the tune of Rs. 2.254 billion due to investment choices made have been settled by the Mahapola Fund, the Minister told the Cabinet, adding that in addition to this the company had incurred tax interest and legal expenses due to administrative lapses, with a loss of nearly Rs. 300 million during 2015 alone due to administrative deficiencies and fraudulent practices of the directors and CEOs of the two companies, Rajapakshe told the Cabinet. According to a breakdown of losses done by the Ministry of Higher Education, in the period 2003-2017 the fund had incurred an estimated Rs. 1.687 billion loss of earnings while the loss incurred by the Mahapola Principal Fund from 2013 to 2014 due to investments under an interest rate below the average market interest rate was Rs. 567.21 million. 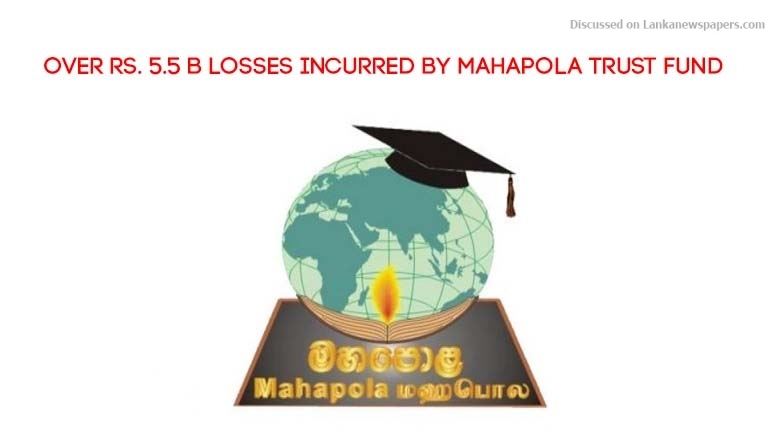 Although serious losses have been made by the trust during the last 15 years, the investment committee which consists of trustees of Mahapola Trust Fund was required to approve all investment decisions, but such a committee had not functioned at all during the time period in question. The fund was assigned to the Development Strategies and International Trade Ministry in 2015 with Malik Samarawickrama as the Minister in charge. The fund was earlier managed under the Trade Ministry which was held by now JO member Johnston Fernando. In November last year Joint Opposition MP Sisira Jayakody lodged complaints both at the Bribery Commission and the Criminal Investigation Department (CID) alleging fraudulent practices concerning the Mahapola Trust Fund causing over Rs. 1 billion in losses. Pointing out the legal issues involved in continuing to manage the funds through two companies established under Registration of Companies Act requiring payment of taxes and continuous losses made by the companies, Rajapakshe recommended to liquidate the companies, cancel the fund management agreement between the Mahapola Higher Education Trust Fund and National Wealth Corporation, and to transfer the main fund managed by the company and all the assets of the company to the Mahapola Higher Education Trust Fund. Further the Government also gave approval to invest all the funds held by the Mahapola Fund only in State banks and Central Bank bonds. The Minister also pointed out that all trustees should be held responsible for the losses incurred by the Mahapola Fund, while stating that undue influence of the subject minister in appointment of the officials to the management companies had resulted in the current situation. National Wealth Corporation and NatWealth Corporation Ltd. yesterday said the restructuring of the two companies would not result in any losses to investors and all funds remained secured.